“If the foot should say, ‘Because I am not a hand, I am not of the body,’ is it therefore not of the body? And if the ear should say, ‘Because I am not an eye, I am not of the body,’ is it therefore not of the body?” (1 Cor 12:15-16). Every part is important! “The eye cannot say to the hand, ‘I have no need of you’; nor again the head to the feet, ‘I have no need of you.’ Those members of the body which seem to be weaker are necessary.” (1 Cor 12:21-22) Each part needs the other parts! Every part has to be involved and working together to have a healthy, efficient body. Let each of us please his neighbor for his good, leading to edification (Rom 15:2). Let each of you look out not only for his own interests, but also for the interests of others (Phil 2:4). Comfort each other and edify one another (1 Thes 5:11). Exhort one another daily…and let us consider one another in order to stir up love and good words (Heb 3:13 & 10:24). As each one has received a gift, minister it to one another (1 Pet 4:10). If you think your responsibility toward the body of Christ ends at showing up Sunday morning and leaving when service is over, you’re going to disobey most of these commands. The level of involvement God wants us to have in each other’s lives is much deeper than what can take place when churches don’t challenge people to love and service. Woodland Christian Church is growing, which is a good thing, but we want to make sure we maintain a family feel. That happens as people get to know each other and develop relationships. Attend church events and activities, but also invite people over to your home. 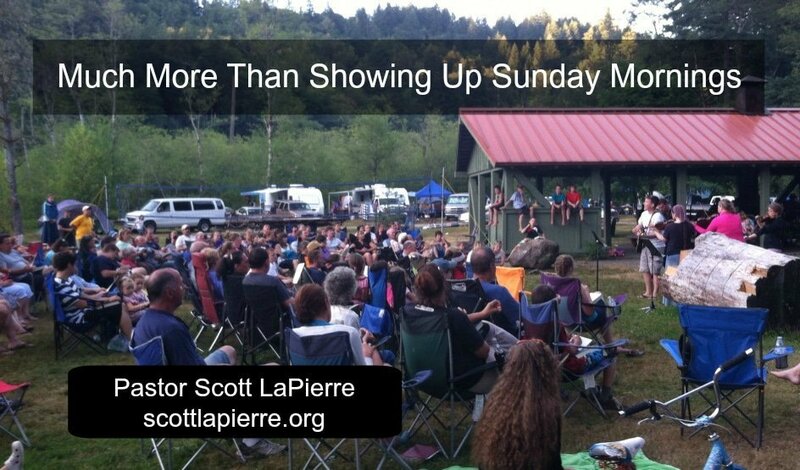 Churh will never be much more than showing up as long as church is mostly sit and listen to a Bible lecture or get some truth from the Sunday School hour. Most of the scriptures you gave are for “one another” participation or the value of the participation of each part, each with differing gifts. Can you grasp that lining up in pews facing a pulpit for 100% of truth expression to flow one-way by one or two men is a shut down for the instructions you gave. The system we have accepted as godly is teaching God’s people to think they have nothing to offer from God to each other. You see that more believers are becoming lax in showing up. Are you observing how what you do does not match with God’s design in the very scriptures you quote? I”m not trying to be nasty or pick a fight. I’m going beyond being a sycophant to spur God’s family to examine the current system and recognize it’s contradiction to the Word, repent, and start obeying the Word. Anyone care to respond? Do you have an objection to my adminishing word? No, I don’t have any objection to what you wrote. I agree people should use their gifts. But Eph 4 says my responsibility is to equip the saints for the work of the ministry. They’re equipped by receiving God’s Word, then they go out and use their gifts. It sounds like you’re saying they should use their gifts while teaching is taking place, which would create a very chaotic environment. Also, the patter you’re criticizing is the pattern modeled for teaching in the Old and New Testaments. Thanks for reading my post and commenting! 1. If you are equipping, the saints will be doing “the work of them ministry”, “building up the body, “speaking the truth in love,” “the whole body, joined and held together by every joint”.. etc. The saints have far more responsibility than you do, but the system handed to you by godly men does not allow them to do anything during this hour. How does “equip the saints” exposit into lecture the saints every week of their life with with perhaps 1% verbal expression from them to the rest of the fellowship? This is a far stretch of the word into something “equip” does not say even close. 2. Your gift, nor any other gift is given to put a fence around a portion of church life and exclude participation from everyone else. The scripture does not teach this. Traditions from men teach this. These traditions are probably all you have ever seen. All the experts agree. They are on your side. But the Bible does not say this that I can find. Can you help me find it? 3. The same is true with “preach the word, in season and out of season…” Does preach equal lecture? None of the 5 different words translated as preach can be exegeted to mean only lecture, no questions, no additions, no objections, no nothing from anyone else. Does “preach the word” mean only one man for the whole time? It does not say that anywhere that I can find. Does “preach the word” mean only a hired man with a special Bible degree? It cannot be exegeted to mean that. Does “feed my sheep” mean only one man lectures the rest because he is the only official feeder? I can’t find this in the Word. 4. There are men in your church that have heard 500 to 1000 Bible lectures already but you consider them still unequipped to teach the saints? Not even for 10 minutes a Sunday? Not even for once a month? These brothers are being asked to come and just sit and listen when all the scripture you gave in this post points to personal expression from them to the rest of the saints. I am asking you to think outside the box of tradition that has been handed to you to see God’s word points to something far greater than what you have been taught. You see the disfunction that results from your current practice. You know the disfunction of so few believers willing or able to share their faith with the lost. You know the dysfunction of the low Biblical illiteracy rates of God’s people in spite of hundreds of millions of $ on weekly Bible lectures. Coast to coast, believers to not retain more reproduce from even regular Bible lectures by one man for the whole time with zero participation of any kind from anyone. If I have missed something in the word, let me know. If you have questions, I will seek to answer. We are family, I got all my sisters (and brothers) with me.